I’ve kicked this idea around for awhile now and thought that the beginning of summer would be as good a time as any to give it a shot. I’m looking to create a student-centered book club — a way to provide some loose structure to interested students while gaining a greater understanding of where they’re coming from on certain topics/pieces. Over the last year, I’ve been delving deeper into some current Young Adult pieces (The Fault in our Stars, Looking for Alaska, 13 Reasons Why, Deadline, Period 8, Divergent, Eleanor and Park, etc.) and I’ve been fascinated by what these authors are bringing to the table. They all bring fascinating tales and characters to life and hit home (sometimes very hard) at the same time. I believe, in many ways, that these pieces still are not being accepted enough by the stodgy, uptight people who make the big decisions (I blogged about this earlier in the year, after a piece about this came out in The Washington Post. That post can be found here). These pieces will one day get the respect they deserve and should one day be on our schools’ reading lists — I’m certain of that. Having said this, I’m also not one who wants to see Mockingbird and Gatsby and some others that have been taught, seemingly, forever, pushed completely by the wayside. There are just as many lessons to be learned by a teen in these pieces as there are in a John Green or Chris Crutcher or Rainbow Rowell piece — I truly believe that. But this got me to thinking about a particular piece that I really want to get some feedback on. 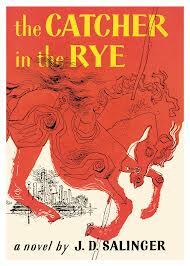 I have my personal beliefs about JD Salinger’s Catcher in the Rye, but I’ll save them for our first meeting. For some, this is THE book on the life of a teenager. And I’ve always wanted to know if it’s stood the test of time. If you’re interested in taking part in this, then let’s figure out a time to meet. Let’s go with about a month — that gives you plenty of time to get it done. Read it with an open mind and figure out what it is that you want to tell others about it. Then let’s meet at The White Rabbit and share it out. Rules? Well, I’d really rather not have any other than you spreading the word to anybody you think might be interested in reading this piece and getting together to talk about it — and then figuring out what we’ll read next. If you have further ideas, let me know, I’m open to them. You can also pick it up at Barnes and Noble or the Greensburg/Hempfield library. Or, if you’re interested in helping a local, small business, check out Red Barn Books on Old Route 30 back behind the mall. Spread the word — through text, email, twitter, whatever. Just let me know if you’re interested and we can see where it goes! I wish you’d done something like this when I was around! I recently read Catcher again for my last children’s literature class and must say it holds up well. Holden still has a lot to offer. If this takes off for you may I recommend Feed by MT Anderson. It is a great piece of YA that I think would open up great discussion about the importance of technology in today’s culture. Ethan, where are you now that you’re not able to make it??? I’m in Oakland for the summer until I start grad school in the fall. Depending on the day and time of it I’d love to stop in if I can. We’re still working on the date/time – will let you know as soon as it’s been decided.